I’ve been meaning to establish a “Thesaurus” series for so long and finally decided to get on with it. I love photos that serve as a specific “thesaurus” with specific themes. I will be posting such photos every now and then. I think they’re great and really enrich one’s vocab. It’s always good to know what each item’s name is. 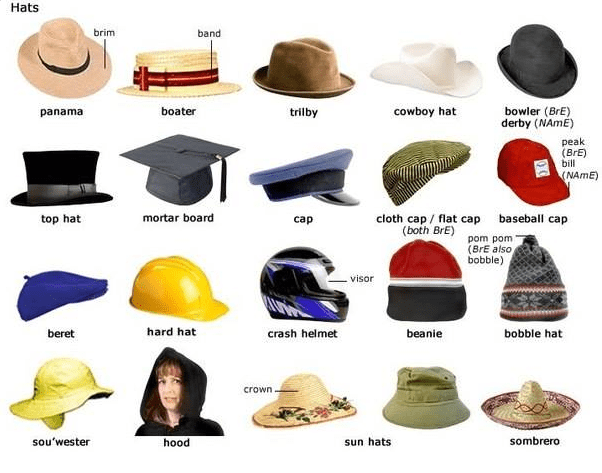 The subject here is hats, only not all headpieces are called hats. Check out the different names, and if you have other expressions, don’t hesitate to share them in the comments section! Nice! I only knew half of them. Thanks for sharing! I’m glad you liked it! To be honest, it wasn’t me who collected them. I stumbled upon it on the internet and I can’t seem to remember where. I saved the photo on my laptop a couple of years back and I have similar photos which I happen to come across on the web so I will be sharing them regularly. Hello! The Sherlock-Holmes style of hat is called a deerstalker. I am so surprised that I knew all of them. I am really pleased! The Sherlock Holmes style is called a deer stalker. The oldest hat shop in the world is in London (Lock & Co whom we can thank for the bowler hat). Here’s an interesting glossary (http://hatsuk.com/hatsuk/hatsukhtml/bible/glossary.htm), just one of many. Interesting origin of name for the ten gallon hat. Hat names can get confused with proprietary names as well. ‘Bobble’ is also called ‘bonnet’ in the UK and ‘beanie’ in the UK and SA. Add “balaclava”, “casque”, “helmet”, “kipa” and “kufiyeh”. You’re right! I simply found the photo like that 🙂 but it’s a good start.